Cash is a flat-coated retriever (flat-coat). The breed was developed in the mid-1800s in the United Kingdom as a retriever for a variety of game, as a family dog, and as a show dog. The first known exhibition of a dog that resembled a flat-coated retriever was in England in 1860. 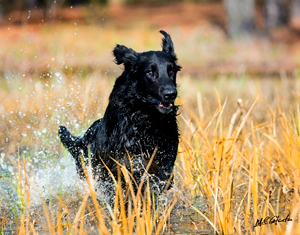 Originally called the wavy-coated retriever, the standard for the breed later called for a coat that is of moderate density and length, and as straight, or flat, as possible. Accepted colors in the breed are black and liver, a dark brown. Flat-coats are high-energy dogs that need exercise and human interaction. This is a good breed for an active individual or family. They are intelligent and mischievous, and can be unruly without careful but gentle training early on, and sufficient exercise throughout their lives. Being retrievers, these dogs have been bred to work closely with their human partners and need both ‘a job’ and plenty of human companionship to be happy. Great care lies behind Cash’s breeding, matching his parents for correct, structure, health, and working ability. Cash was 11 years old when this photo was taken and remains active today, as he approaches his 13th birthday. He has fulfilled all the characteristics expected of his breed, having achieved a Grand Championship in the show ring, Master Hunter title at AKC retriever hunting tests, and being a wonderful and loving companion dog. Flat-coats have their share of health problems, including risks for certain cancers, hip dysplasia, epilepsy, and other illnesses. All of these are areas that the AKC Canine Health Foundation is supporting innovative research to improve the lives of dogs, which is one of the reasons that I support the Foundation.